© Gunther von Hagens' BODY WORLDS, Institute for Plastination, Heidelberg, Germany, www.bodyworlds.com. Our family has followed the progress of the Austin Planetarium for years now. For those of you who may not know, Austin is the largest city in the United States without a planetarium. Hard to believe, I know! So I was excited to hear that the Austin Planetarium was changing names to the Texas Museum of Science and Technology and opening a facility in Cedar Park. I was even more excited that their first project was to host the world renowned BODY WORLDS & THE CYCLE OF LIFE by Dr. Gunther von Hagens. 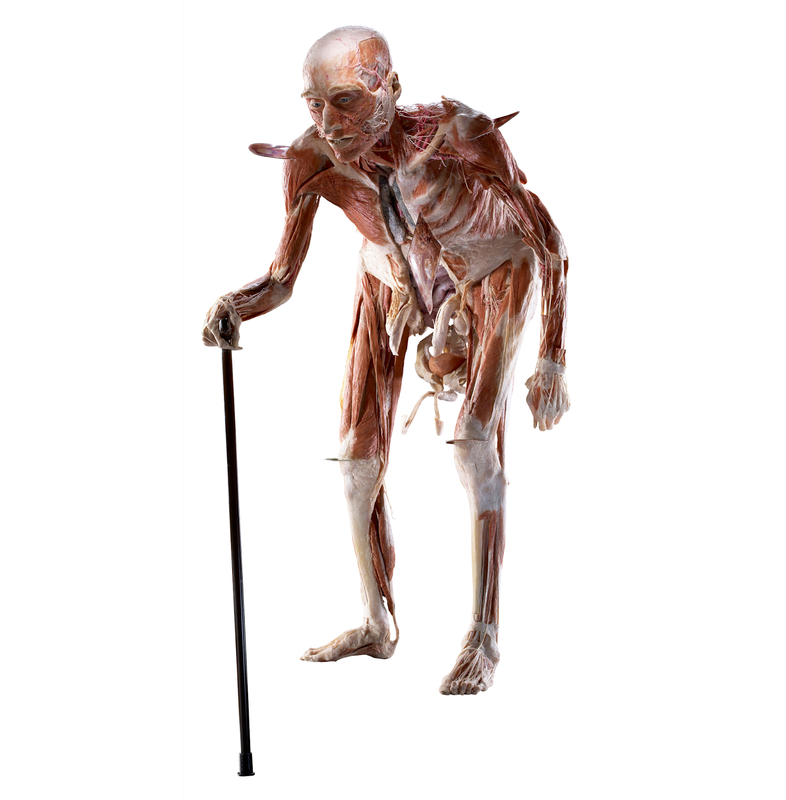 Body Worlds is an amazing exhibit that preserves bodies through a process called Plastination, a scientific process invented by pioneering anatomist Dr. Gunther von Hagens. This exhibit celebrates the wonders of the body in childhood, adulthood and across the arc of aging. Visitors see real bodies that develop from a small fetus through old age. Signs along the way explain this amazing process of aging, as well as external effects such as exercise, disease and more. My boys and I went to visit today and were completely fascinated. We walked into the museum not knowing what to expect. The building was previously an indoor soccer field and the museum comes complete with leftover astroturf. There are some small science displays, but the majority of the area is taken up by the Body Worlds exhibit. We sat down with Torvald Hessel, the executive director of the museum. He told us of his years-long struggle to try and bring a planetarium to Austin. And his pride at being able to showcase this amazing exhibit for the first time in Central Texas. After viewing an intriguing 7 minute video about the process of Plastination, we walked into the exhibit -- and completely forget where we were for about an hour and a half. It was seriously that good! In all, the exhibit has 18 full bodies on display. These displays are a stunning combination of both science and art. Clear glass cases allow you a 360 degree of the figures. But even more interesting to me personally were the hundred or more specimens on display. We could see how the entire digestive system works, the amazing network of veins, and the strong but light skeletal system that we all rely on but rarely think about! We could see the comparison of a healthy liver and a liver with cirrhosis, a healthy joint and one with arthritis, a obese body and a regular one. But is it appropriate for children? Apparently the museum gets this question a lot. The answer, in my opinion, is most definitely yes! We went to a similar exhibit five years when my youngest son was only seven and it was a fantastic experience for him. Yes, there are "naked" bodies, and some discussion of reproductive organs, but it is all extremely healthy and appropriate for any age. The focus is on the amazing machine that is our body - and who can't appreciate that? The exhibit is free for children under 6, and it is probably true that what they get out of the displays is less than an older child, but I firmly believe learning happens at all ages. On March 20th, the Austin Planetarium opened as the Texas Museum of Science & Technology (TXMOST) in an interim facility located in the former SoccerPlex building in Cedar Park. The building is 30,000 square feet with 35-foot ceilings, which will enable TXMOST to build a smaller version of the permanent facility to come. They changed their name from the Austin Planetarium to the Texas Museum of Science & Technology (TXMOST) to better communicate their vision of bringing a world class science and technology center to the Austin area. * TXMOS has plans for building permanent science displays as well as a planetarium in the upcoming year. (Can't wait!!) They are also working on bringing in another exciting exhibit in September, when this exhibit ends. So stay tuned. * I personally did not have any difficulty finding the museum, but it does have somewhat limited signage, so consult a map before you head out. I saw the Body Worlds Exhibit in Buffalo, NY in 2009 and I'm so glad to see it has finally made it to Austin. My son is a medical professional and this is the perfect birthday gift for him. I encourage everyone to take the time to view this amazing exhibit.